On May 16, Dutch Bros. Coffee Granite Bay will be donating proceeds to Granite Bay High School’s Sober Grad Night. 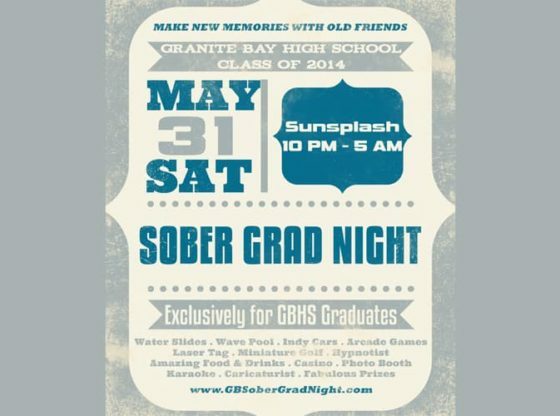 Sober Grad Night aims to provide high school seniors with fun activities on the night of graduation as an alternative to drinking. Graduation night across the nation has proven to be one of the most dangerous times of a young person’s life, due in great part to the presence of alcohol and drugs. In addition, Dutch Bros. will be on-site selling Dutch Bros. Blue Rebel energy drinks and coffee on Sober Grad Night for students, volunteers and parents who need help staying awake through the overnight party. Dutch Bros. at Granite Bay is locally owned and operated by a husband-and-wife team, Brian and Mattie Place. Dutch Bros. Coffee, ranked by J.D. Power and Associates as highest in customer satisfaction compared to other coffee companies in its 2012 and 2013 Specialty Coffee Retailer Satisfaction Reports, is the country’s largest privately held, drive-through coffee company, with over 200 locations and over 2,000 employees in seven states.